By marrying the classic Fat Control/Midboost with our new Overdrive we have created the ultimate overdrive/distortion pedal. From fat crunch to extra fuzzy to over the top, this pedal does it all. The midboost goes from thin to ballsy, while the overdrive has the ability to go from edgy clean to filthy in germanium mode and edgy to dirty while in silicon mode. Overdrive: Our new Overdrive features variable gain control from unity to over 100 times, that output drives our clip generators (silicon or germanium diodes, switchable) for the ultimate in overdrive sound variations. 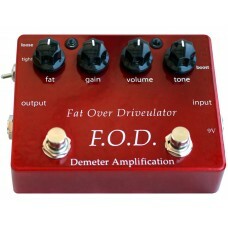 The overdrives controls are gain (drive), a very usable tone control, volume control, and loose/tight switch. Runs off a standard Boss type 9v power supply.